Modern science has finally confirmed an essential component of the Pleiadian teachings: Our Universe is not linear; it moves in spirals. Human evolution also unfolds in spirals, rather than the linear progression we call “progress.” Sharing the cosmic wisdom teachings they have received from the Pleiadian group known as Laarkmaa, authors Pia Orleane and Cullen Baird Smith reveal a new system of Pleiadian-Earth energy astrology centered on the spiraling and interconnected movement of Universal and Earth energies, rather than on time, and explain how this new wave of Pleiadian wisdom can support human evolution. The authors identify two major spiral patterns that influence us: the 13 spirals of Universal energy that reflect cosmic laws and cosmic truth and the 20 spirals of Earth energy that reflect how humans experience themselves, each other, and their environment. They explain the dominant energy of each of the 13 Universal energy spirals and how they cycle in 13-day periods. 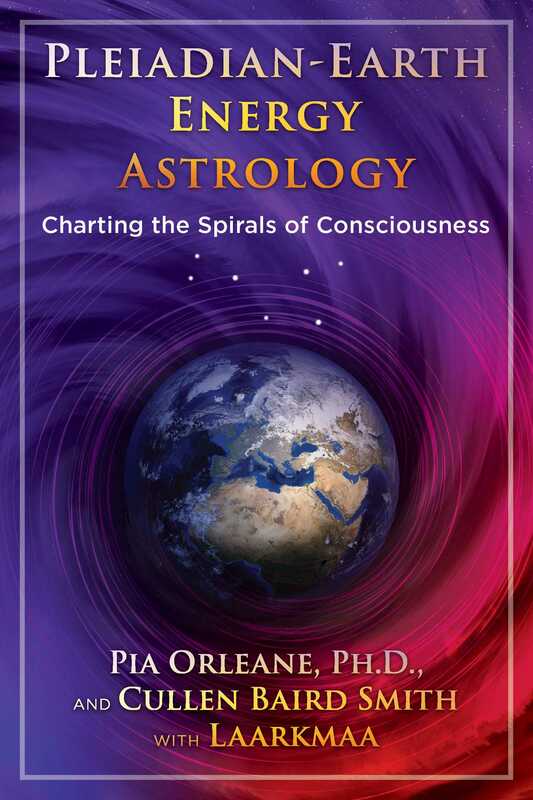 They detail how these 13 Universal energy spirals interact with the cycles of the 20 Earth energy spirals on each calendar day, providing a hundred-year ephemeris and a Pleiadian perspective with which to understand the events in your life. Offering practical examples, they show how you can consciously use the energies prevalent on a given calendar day to your personal, spiritual advantage. We Pleiadians offer the following information to humanity to show you a larger reality than the reality you perceive through the third dimension. In the universe, all energy spirals in waves; it’s not linear or static. We want humanity to understand how energy works in the universe, to align yourselves more harmoniously with all others and begin to live in a more balanced way, benefitting all life. Time as you perceive it does not exist in the cosmos. Time is circular, if it exists at all. Its spiraling energies take you from one point to another. On Earth, you no longer arrange your lives according to the movement of energy in relationship to nature or the cosmos, as you once did in ancient times. Your technology and current linear thinking displaced you from your earlier nature-based wisdom. You move about your world identifying with an artificial calendar that is disharmonious with nature and the cosmic movement and flow. Cosmic energy moves in cycles of thirteen, from initiation to completion, spiraling in a harmonious way and inclusive of all that is. While each of the universal energies builds upon the previous one, this is not a linear system, for each energy exists in and of itself alone. The Gregorian calendar you devised measures time based on a system of twelve, where you divide your year into twelve months and your days into two sets of twelve hours. Your current astrological systems are also based on a system of twelve. Because of this, you continually begin new cycles before you’ve completed old ones. There is no space for integration; therefore you never incorporate what you learn. This skewed view of the true reality keeps you stuck in cycles and patterns of thoughts and behaviors, preventing you from remembering your true nature and your relationship to the cosmos. This book contains the instructions--the map and the pathway--for activating greater consciousness, larger visions of reality, peace, harmony, connection, understanding, and abundance for all. Energy is intelligent and can manifest in any form it chooses. Everything is related because everything is connected. Your individuality is intended to allow you to focus upon specific forms of energy and share your perspectives with one another. This allows you to create a stronger and more functional whole that sees the value of all aspects of duality (but not as a separating function). Each energy you experience has both a higher and lower vibrational form of manifestation. You choose the level at which you wish to participate. We present these energies through a higher vibration, so you may align yourselves with higher and higher choices. Thoughts and choices have much more power than you know, and largely contribute to manifesting what happens in your lives. How you think determines what you manifest. When you choose your thoughts more consciously, you elevate the availability of possibilities because you align with cosmic flow. Remember, every choice you make builds upon and determines the outcomes of your manifested experience. And if you use the concepts introduced in this book, you’ll have a better understanding of energy. Then you accelerate your consciousness and enrich your lives. Re-creating calendars (based upon energy rather than time) to guide your lives is an excellent place to start. Once you understand the flow of Universal energies, you’ll see the benefit in organizing your schedule and determining your actions according to the energy present, rather than making blind decisions based on convenience and an artificial sense of time. What if you designed your calendars based upon the flow of Universal energies and began to schedule your appointments in harmony with appropriate energies? For instance, you would schedule a meeting to establish a new company during the energy of four (foundation). Or you would take time off to meditate during the energy of seven (merging and mystical connections). You would schedule gatherings for family and friends or attempt to start a community during the energy of eight (connection). These are a few simple examples of how you can begin to reorganize your lives with less resistance and more flow. Now we will give you an introductory picture of how to use all the Universal energies. The energy of one is available for beginning new projects or for starting something anew. You may use this energy to begin again every moment. Incorporate it into your life. The energy of one, representing unity, splits into two, offering you different perspectives of the unified whole. The energy of two represents duality. The collective consciousness of humanity seems to be stuck in a misunderstanding about this energy, rather than using its higher vibratory possibilities for growth. Currently, you experience the energy of two as a dynamic tension, bringing conflict and competition between polar opposites. We want to help you move beyond the pain and suffering present in your misunderstanding of duality. Universal two energy is meant to show you both sides of the same coin so you can see several perspectives at once. Once you better understand the energy, you can use it to create more harmony by seeing that differences actually bring a greater perspective rather than adversity. The next presenting Universal energy of three is the energy of creation. It provides you the opportunity to add your own newly conceived perspectives to the two opposite perspectives of duality, thereby creating something new. The energy of three is a powerful force of creativity in the universe. Proper use of this energy can help you become conscious co-creators with the cosmic energies. The four Universal energy provides a foundation to stabilize your creations. Misusing this energy at a lower vibration causes you to be stuck or rigid in your beliefs. Using four energy's higher vibration gives you a solid foundation of trust, love, compassion, and joy to support your continued growth and development. Cullen Baird Smith, trained in anthropology and archaeology, is coauthor, with Pia Orleane, of two books, Conversations with Laarkmaa and Remembering Who We Are. Smith, along with Orleane, is one of the chosen channels for the group of Pleiadian beings known as Laarkmaa. He lives in Europe.